Nothing says New Zealand like kiwifruit, except that kiwis are originally from China and today are grown around the world. In any case, the good news is that many of us have access to this delicious fruit throughout the year. And like other fruits, kiwis are easily made a part delicious, inviting, and extra-healthy meals, when we eat the HumanaNatura way and follow HumanaNatura’s OurPlate healthy eating guidelines. 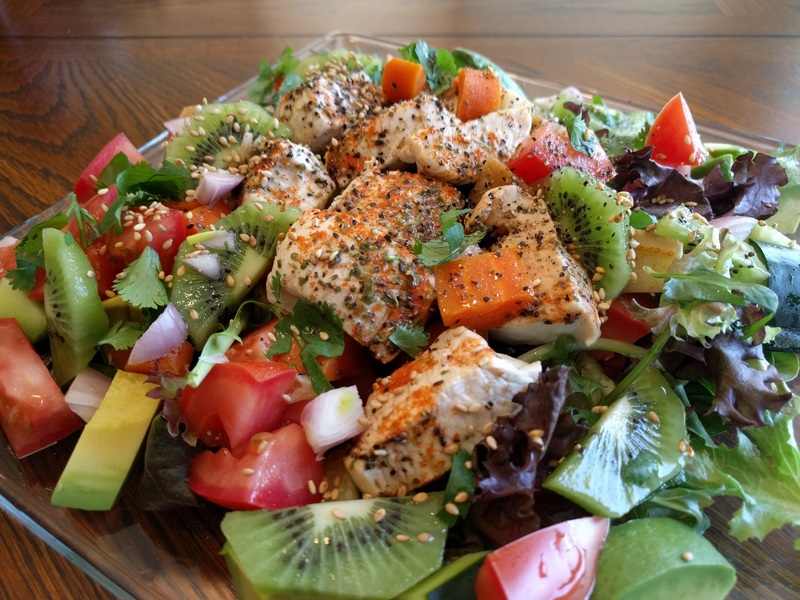 Our Chicken and Kiwi Salad Meal is a great example of how fruit can naturally improve and enliven our daily meals. Our featured HumanaNatura Salad Meal begins by steaming some bite-sized chicken pieces, seasoned with red pepper and a Mediterranean herb mix, on top of a base of diced carrots, white sweet potato, and red onion, along with crushed and finely chopped garlic, for about five minutes (see our Cooking With Steam Overview for guidance if you are new to food steaming). When done, the chicken and root vegetables are allowed to cool for several minutes or are chilled, covered, for an hour or more. As the cooked chicken and vegetables cool, a salad base of mixed greens is combined with a simple veggie mix of chopped tomatoes and cucumber. Arrange the cooked chicken and root vegetables on top of the salad, and garnish it with sliced kiwi, finely diced red onion to taste, chopped cilantro, and a scattering of seeds or nuts. Dress and season the salad with herbs and black pepper to taste, and serve promptly. Fast, delicious, and satisfying! Learn more about creating naturally delicious, inviting, and nutritious meals like this via OurPlate, HumanaNatura’s simple natural eating guide for designing optimally healthy modern meals. Experience how this science-based and 100% natural approach to our daily meals can change the way you eat, feel, and live. Sharpen your skills at making delicious and naturally healthy Salad Meals via our Salad Meal Overview. And explore the science and key principles of optimal Natural Eating through HumanaNatura’s comprehensive Personal Health Program. Greetings from HumanaNatura at the cross-quarter! In the natural year, we are now midway between the naturally more evocative period of the recent solstice and the more balanced time of the coming equinox. Everywhere on earth, there is clear but unmistakable change – away from the height of summer and depth of winter in each hemisphere and toward the relative balance of fall or spring – an ongoing rhythm of life on earth that touches and can aid us all. 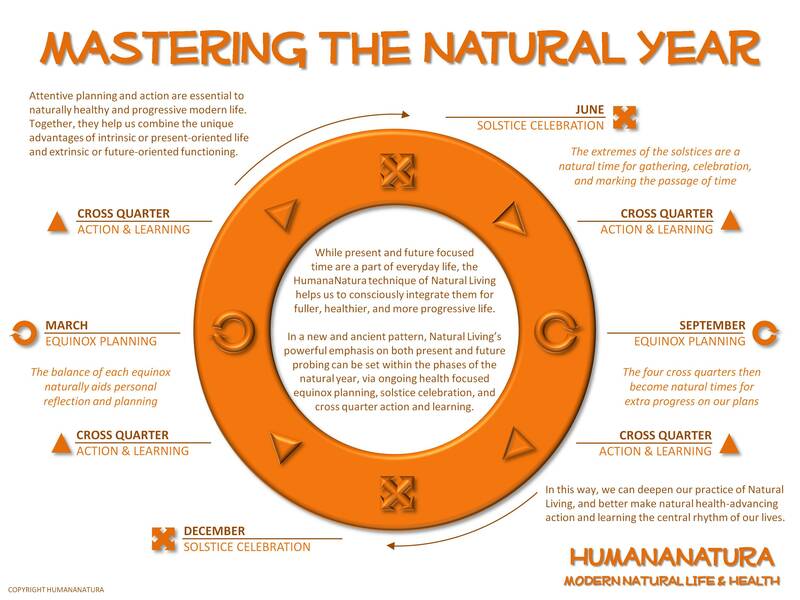 In the HumanaNatura natural health system, and as explained in our Mastering The Natural Year graphic and post, we recommend extra progress on our Natural Life Plans around each cross-quarter. At the equinox-nearing cross-quarter, this is so we have adequate completed actions and learning at the equinox – in another six weeks or eighth of a year – when HumanaNatura encourages reflection and updating of our plans. If you have not yet created a Natural Life Plan to guide your use and expression of the third HumanaNatura technique, Natural Living, our links will take you to our planning worksheets and seven-step planning process. Together, these resources will help you to begin more intentionally health-centered and naturally progressive life in the days and weeks ahead. Our newest member newsletter was sent today as well, which is published eight times yearly in harmony with the natural year, providing updates on HumanaNatura’s resources, programs, and worldwide health campaigns. To receive future HumanaNatura newsletters or learn more about our global practitioner-advocate network, go to Join HumanaNatura.